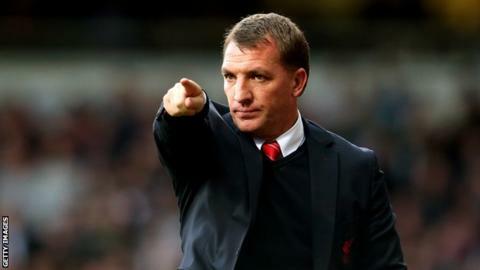 Liverpool boss Brendan Rodgers says his players will keep fighting for the Premier League title. Rodgers conceded the title to rivals Manchester City after Liverpool's 3-3 draw with Crystal Palace. But the 41-year-old now claims he has not completely given up hope with City playing Aston Villa on Wednesday. "You never know what can happen. I promise for the time I am here we will fight for our lives and we won't finish until Newcastle," Rodgers said. The Reds require Manchester City to drop points in at least one of their last two games against Aston Villa and West Ham. If City win one and draw one, Liverpool must beat Newcastle on Sunday and vastly improve their goal difference. If City draw both games, a win on Sunday will be enough for the Reds. If City lose both games, Liverpool will already have enough points if Chelsea do not beat Cardiff. Liverpool, who have not won the English title since 1990, are a point clear at the top of the table ahead of their final match against Newcastle at Anfield on Sunday. However City have two games left, at home to Villa and West Ham. Rodgers, who was speaking at the club's awards night on Tuesday, also says Uruguay striker Luis Suarez deserves the personal accolades that have come his way this season. In addition to the Professional Footballers' Association and Football Writers' awards, Suarez, 27, won Liverpool's goal of the season, players' player of the year and supporters' player of the year. "He has thoroughly deserved it," added Rodgers. "As a team they have been outstanding but he has been absolutely phenomenal."